Alice Mary Norton was born in Cleveland, Ohio. Her first writing experience began as editor of a literary page in the school’s paper called The Collinwood Spotlight. During this time, she wrote her first book, Ralestone Luck, which was eventually published as her second novel. She dreamed of becoming a teacher, but due to the Great Depression, she took a job working at the Cleveland Library System, in whose employ she remained for 18 years. She kept writing at this time and in 1934, she published her first novel. At this time she legally changed her name to Andre Alice Norton. Andre Norton is the pen name she adopted for marketing reasons. At this time boys were the main audience for fantasy tales and it was thought that they would not read stories written by a woman. Andre is a Norwegian male name, but obscure enough in the United States that had a more androgynous feel. Andre Norton remained working for the Cleveland Public Library until 1950 when she retired due to her health. She took a job as a reader for publisher and editor Martin Greenberg at Gnome Press, a science fiction small press. She remained there for eight years until she shifted into becoming a full-time writer. At that point she had twenty one novels published. She would go on to write hundreds of novels, some of which are still being published today after her death in 2005 of congestive heart failure. Her first science fiction novel was Star Man’s Son, 2250 A.D. published in 1952. She was a prolific novelist in the 50’s, many of her books selling in the juvenile market. She wrote over a dozen speculative fiction series, but her longest and most popular was the Witch World series, of which The Crystal Gryphon is a part of. Norton was nominated twice for the Hugo Award, for the novel Witch World in 1964 and for the novella Wizard’s World in 1967. She has been nominated three times for the World Fantasy Award for lifetime achievement and won the award in 1998. Andre Norton was a founding member of the Swordsmen and Sorcerer’s Guild of America (SAGA). They were a group of fantasy authors led by Lin Carter and whose work appeared in her anthologies, Flashing Swords!. She was the only woman of the original eight members. Known as the Grand Dame of Science Fiction and Fantasy, Andre Norton wrote novels for over 70 years. She has had a huge influence on the entire genre, having published well over 300 titles and having inspired at least four generations of science fiction and fantasy writers. Notable authors who cite her as an influence include, Greg Bear, C.J. Cherryh, Mercedes Lackey, A.C. Crispin, Charles de Lint, Joan D. Vinge and many others. The Crystal Gryphon is the first book of the Gryphon Trilogy. It is one of the first fantasy romances and follows what is now a standard format, of writing the story via duo viewpoints, that of Lord Kerovan of Ulmsdale and his promised bride Lady Joisan of the Dales of High Hallack. When Kerovan’s mother was to give birth, she was forced to shelter in the mysterious ruins of the Old Ones. Due to this, or perhaps the rumor that she had blood of the old race herself, her son was born with small cloven hooves instead of feet and his eyes were the color of butter amber. His father decides to name him heir despite his unusual features, and to prove his intentions, he “ax-weds” his ten year old son to an eight year old girl of good connections. Young Joisan remains with her family, to be sent for when she comes of age. When Kerovan becomes a man, there is danger afoot as the Hounds of Alizon attack the mountains of High Hallack and Kerovan joins the Dale armies to represent Ulmsdale. Before he leaves, he sends Joisan a beautiful crystal gryphon encased in a globe, an object of power that he had found, almost as an after thought. Soon, Kerovan’s father dies and his mother rejects Kerovan’s claim to Ulmsdale, wishing to pass it on to her daughter and her new betrothed. Ulmsdale is betrayed to the enemy and falls, leaving Kerovan to depart and travel across the war-torn lands of High Hallack to Joisen’s Dale. As she has grown, young Joisen learned how to wear armor and to fight with a light sword. She wears the tiny gryphon under her mail as a keepsake from her unknown fiance, a man she has never met in person. When Kerovan finds her, she mistakes him for one of the Old Ones due to his cloven feet and reserved manner. The two set off into the wilderness as the Dales fall to the invaders, seeking the lands of the Old Ones and learning about the power of the gryphon and of each other. They hope to save their people from enslavement and destruction. I confess that I have not read the entire Witch World saga, there are many books to the series and they interact in a way that can be confusing if you don’t know where the books fit. However, the two books in the series that I consider to be my favorites is the original Witch World and The Crystal Gryphon. The story about Kerovan and Joisen has stuck in my mind for decades. The romantic duo point of view of the writing that allows you to understand the characters emotions during their growing relationship created a chemistry that was hard to forget. Much of fantasy and science fiction during the time when this book was written was geared toward boys and therefore romance was an element that proved missing in many books and there were few female protagonists. Joisen, while still having an old-fashioned “stay by your man” outlook, was a strong female lead in her day. As a young girl reading this novel, that held a certain appeal to me. 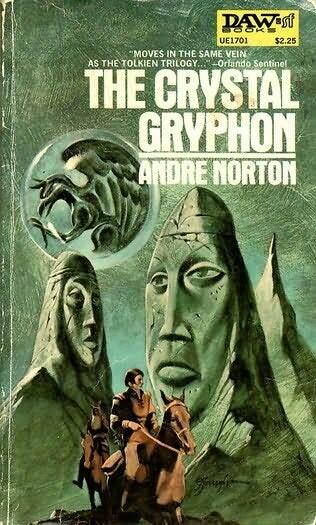 I consider Andre Norton to be one of my influnces in my own writing style. Most of my stories also have elements of romance and strong female characters. How else would I write after growing up reading Andre Norton? The Crystal Gryphon is out of print, but you can find a kindle version on Amazon and used paperbacks. While this trilogy has become a little more obscure these days, it is one that I can recommend. The Gryphon Trilogy is part of the High Hallack Cycle of the Witch World Series.